As it turns out, a few Angelenos aren't interested in having everyone speed between LA and SF. According to the LA Times, a number of LA county communities, including Santa Clarita, San Fernando, and Pacoima, are protesting the long-planned SoCal bullet train route, claiming it will cause irreparable harm. 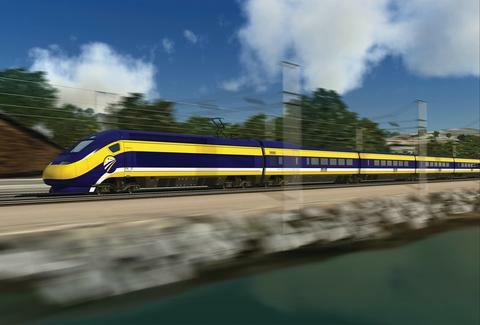 The California High-Speed Rail Authority broke ground on the high-speed rail system (the US' first) back in January. The project, which is expected to be finished in 2029, would allow commuters to travel between LA and SF in under three hours. The Times reports that residents and local elected officials are insisting that the planned route (which would follow California 14 through the mountains between Palmdale and San Fernando) should be abandoned due to its above-ground track. The alliance notes that local businesses in Downtown San Fernando, as well as the city's police headquarters, would be displaced if the planned route is built. A spokeswoman for the rail authority said, "We will continue to have open dialogue with [the communities]." The Times also notes that a recent analysis done by the rail authority shows that noise and vibration from the route could affect 20,000 residences, 25 parks, 47 schools, 48 churches, several hotels, archaeological sites, and wetlands within a half-mile of the track. The state has apparently considered alternative routes to the longer freeway alignment, which would include around 20mi of tunnels from Burbank through the Angeles National Forest, the idea of which has also left community members unnerved -- in this case, regarding impact on water quality. The LA City Council resolved on Friday to have the state conduct environmental studies of the water issue, as well as noise. It's unclear whether or not the protest will halt the development of the $68 billion train system. If you're a proponent of the route, don't fret quite yet: futuristic travel is still within reach! You know, in like 15 years. Lucy Meilus is a staff writer for Thrillist. Follow her on Twitter at @Lucymeilus and send news tips to news@thrillist.com.